Mile 0.0. 32°31’25.3”N, 114°20’52”W. Key Junction. At A-6 take road to left (west) that goes to Foothills Blvd. and Yuma. This is an easier but less scenic alternative to the route via Fortuna Mine (for Fortuna Mine, continue straight north at sign A-6). At A-6 turn west (left). Drive 3.6 miles to A-4, and turn north (right) on dirt road that becomes Foothills Boulevard. Junction A-4 is at 32°31’25.5”N, 114°23’34.5W. Route passes over small gravel hills and minor dunes, and past patches of desert club cholla, creosote flats with many ocotillos, and several closed trails to active do-not-enter military sites. The gravel hills may indicate river bars in the ancient Colorado or Gila rivers. The road parallels a power line except for a brief 1.2-mile stretch when its wires mysteriously go underground. This alternate route crosses landscape more like what early travelers would have faced – it is unlikely they would have gone by way of Fortuna Mine because there is no water that way and the road can be quite rocky. Early maps of the area show El Camino del Diablo Oeste (West) angling northwest from here roughly in a bee-line to Yuma Crossing, where parties could ford the river or board ferries for a fee. Make a point to visit the historic district and riverfront of Yuma. 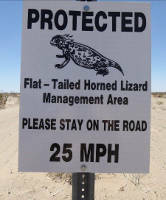 Speed limit is 25 mph – use caution for horned lizards and other desert critters. This may not look like home to us, but it’s all they’ve got. This road is through the sandy habitat of the flat-tail horned lizard (Phrynosoma mcallii), an endangered species. The Marine Corps is very protective of this little lizard, and unless you’re asking to do KP or 50 pushups, you should be too. 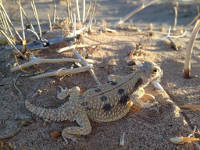 The lizard, named for Col. George A. M’Call (U.S. Army) who collected the type specimen in the 1850s, has a small home-range in the Sonoran Desert. Although well adapted to heat and sands, it is threatened by off-roading, cities, and farms overrunning its habitat. It is specially camouflaged from predators with side fringes that eliminate shadows in the open desert – it is kind of a stealth lizard, like the F-35 that “conceals” itself from radar. Too, different populations can match their bodies to local soil or rock using a combination of color-creating cells, including black melanophores and red chromatophores in the upper layer, scattered over a layer of reflective white iridophores. For food, they prefer ants, which they catch with a flick of their tongue and swallow without chewing. Apparently they are immune to the stings of ants, but they coat each ant with a protective mucus as they swallow them. Too, they eat other small insects and they drink dew or rainwater, though they excrete semisolid uric acid and do not urinate. Horned lizard motifs appear in the pottery, baskets, and rock art of many Southwest Indian tribes. Mile 6.3: Drive north 6.9 miles to Goldwater Range boundary at sign A (32°37’35.7”N, 114°24’35.3”W). This is the intersection of Foothills Blvd. and 56th Street. Mile 10.5: From boundary, drive north 2.7 miles on paved road to Interstate 8. Congratulations! You have survived El Camino del Diablo. Yuma or Bust! You’re almost there.